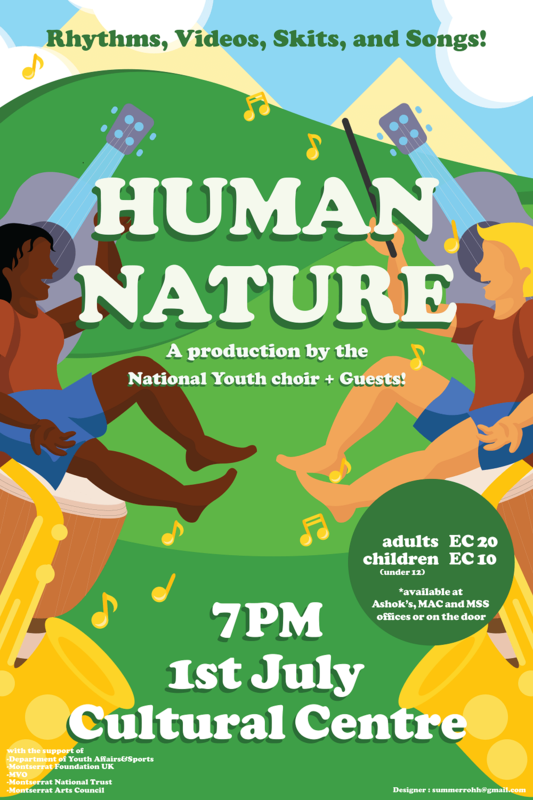 On the 1st of July, talented and creative young musicians from all of Montserrat invite you to Human Nature, a production by the National Youth Choir (NYC) in collaboration with Montserrat Arts Council, Department of Youth Affairs and Sports, Montserrat Volcano Observatory and Montserrat National Trust. The performances include fun and thoughtful sketches written by Sandrae Thomas, original songs composed with the choir, alongside current hits and some old time classics. The choir will be supported by Montserrat’s most daring band ‘Pulse’, the ‘Strummin’ Strat’ ukulele club, ‘Re-beat’ drumming band and a group of young, promising brass players. The production will explore different aspects of human nature as well as that of humans in nature. In other words, what does it mean to be human? There will also be a presentation of a new musical film made in Montserrat in collaboration with the scientists from the MVO, with NYC’s Director Mārtiņš Baumanis musically interpreting the data of the last 20 years of its activity. Make sure you don’t miss the sounds and sights on the 1stof July, 7pm Montserrat Arts Council time at the Cultural Centre. There will be a chance to meet the cast and performers before the event from 6:30PM in a red-carpet photography event. Tickets available at Ashok’s, MAC and MSS or at the door.